Nasal and sinus cancer affects the nasal cavity (the space behind your nose) and the sinuses (small air-filled cavities inside your nose, cheekbones and forehead). It's a rare type of cancer that most often affects men aged over 40. Nasal and sinus cancer is different from cancer of the area where the nose and throat connect. This is called nasopharyngeal cancer. These symptoms can be similar to more common and less serious conditions, such as a cold or sinusitis. See your GP if you notice any unusual or persistent symptoms. It's very unlikely they'll be caused by nasal or sinus cancer, but it's worth getting them checked out. If your GP thinks you might need some tests to find out what's causing your symptoms, you'll usually be referred to an ear, nose and throat (ENT) consultant in hospital. If you're diagnosed with nasal and sinus cancer, you may have a CT scan, MRI scan or PET scan to help stage and grade the cancer. The Cancer Research UK website has more information about the stages and grades of different types of nasal and sinus cancer. Several factors are known to increase the risk of developing nasal and sinus cancer. The Cancer Research UK website has more information about the risks and causes of nasal and sinus cancer. The treatment recommended for you will depend on several factors, including the stage at which the cancer was diagnosed, how far it's spread, and your general level of health. If you smoke, it's important that you give up. Smoking increases your risk of cancer returning and may cause you to have more side effects from treatment. Your treatment will be organised by a head and neck cancer multidisciplinary team (MDT), who'll discuss the treatment options with you. A combination of treatments will often be recommended. The Cancer Research UK website has more information about the treatment of nasal and sinus cancer. 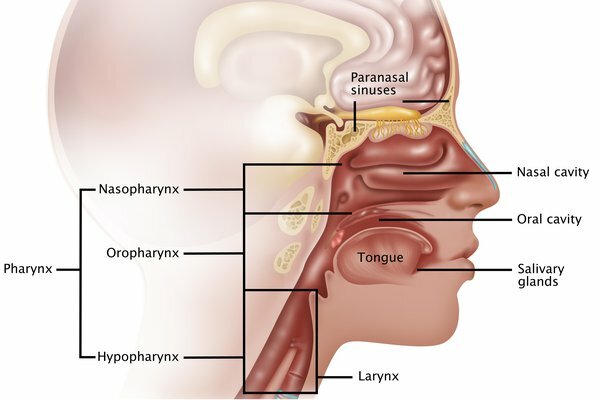 There are many different types of cancer that can affect the nasal cavity and sinuses. The outlook varies, depending on the specific type of nasal and sinus cancer you have, its exact location, how far it's spread before being diagnosed and treated, and your overall level of health and fitness. More than 70 out of every 100 people with nasal and sinus cancer will survive for 1 year or more after diagnosis. Around 50 out of 100 people will survive for 5 years or more after being diagnosed. Cancer of the nasal cavity generally has a better outlook than cancer of the sinuses. The Cancer Research UK website has more information about the outlook for nasal and sinus cancer. Being diagnosed with nasal and sinus cancer can be a shock and may be difficult to come to terms with. Everyone reacts differently. Talking about how you feel with your family and friends can be a big help. But if you're unable to talk with family or friends, other sources of help and support are available. For example, Cancer Research UK has nurses you can speak to by calling 0808 800 4040 (freephone), 9am to 5pm, Monday to Friday. The Cancer Research UK website also has more about coping with a diagnosis of nasal and sinus cancer and living with nasal and sinus cancer.